Welcome to the first book review of 2019 for TLC Book Tours. It’s time for turning over a new leaf and this book might help you keep some of those lofty goals. 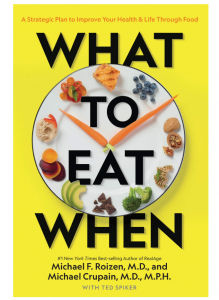 What to Eat When by Michael F. Roizen, M.D. and Michael Crupain, M.D. is an appropriate book to start the year as we all struggle with those New Year resolutions. 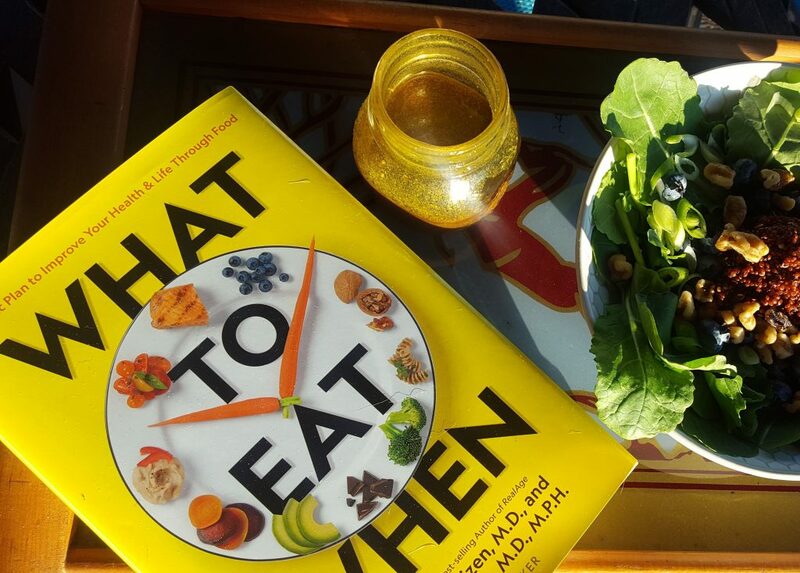 Please use the hashtag #whattoeatwhen and tag @tlcbooktours. The last self-help eating book I read was Fit for Life back in 1989. (Seriously.) I loved that book, which as I recall, was full of recipes, some pretty good ones at that. It got me on a juicing trend. I have no idea where that book is today. It’s time to change up and really think about what we eat and how we eat it. Although this book is recipe free, it does have some great tips on getting the most out of food, like vegetable preparation and freezing. I appreciated “The Sub Shop” segments which acknowledged not-so-healthy traditions but offered better plans: oatmeal instead of cereal, egg white fritatta with veggies instead of bacon and eggs. (You get the gist.) A lot of the “Subs” are no-brainers but we obviously need gentle reminders. After initially skimming the book, I immediately went to Chapter 35, “What to Eat…When you Don’t Want to Lose Your Mind.” The authors do have a sense of humor, especially in this chapter. Perhaps you cannot remember where you placed your keys. Or maybe you can’t remember a person’s face. Sometimes you forget what you just said. And sometimes you forget what you just said (266). There is a bit of playfulness throughout the book. Again, the information here wasn’t revolutionary but it did cause me to re-plan menus. Besides just exercising our brains by jump-starting our neurons, the best food to eat is salmon, ocean trout, leafy greens, walnuts, coffee, olive oil, and blueberries. CUT OUT THE SUGAR! I did find “The 10 Commands of the When Way” at the back of the book very helpful. All-in-all, I’m glad I received this book for review. It’ prompted me to think about what was coming out of the kitchen and what we were putting in our bodies. 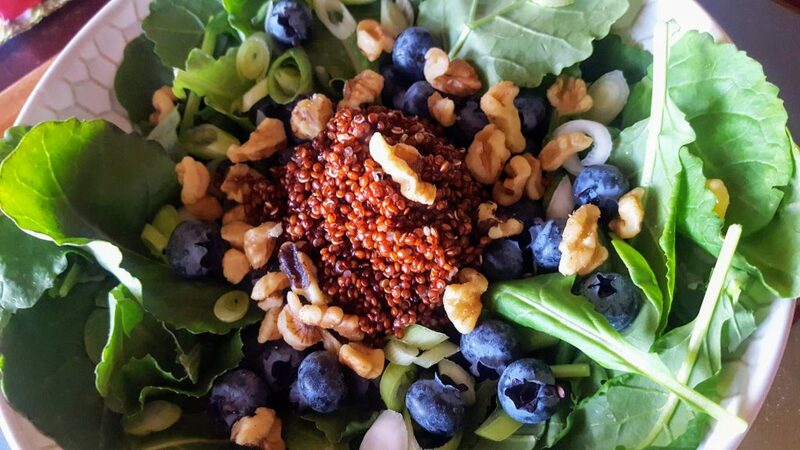 Leafy greens, walnuts and blueberries combine for a super salad meal. Cook the quinoa and set aside to come to room temperature. Wash and dry kale. Slice the green onions. 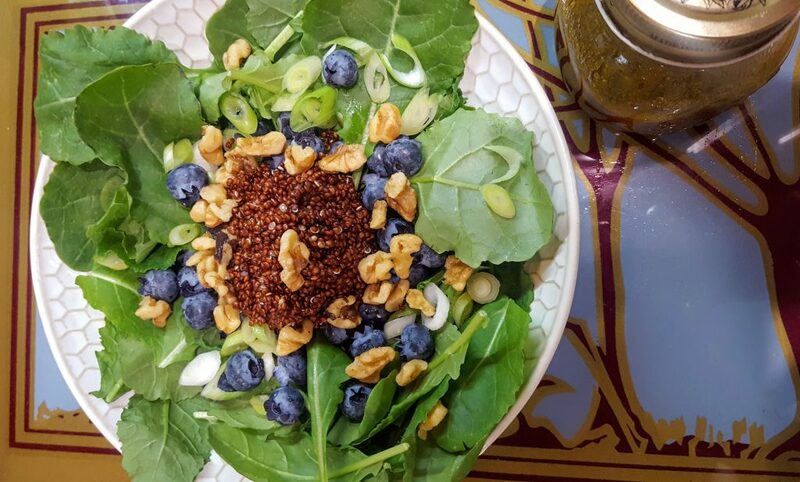 Divide the kale, green onions, blueberries and cooled quinoa between two bowls. Sprinkle with the walnuts. Whisk together the olive oil, vinegar, honey, mustard, turmeric, and lemon juice. Season with salt and pepper. This whole reading experience really got me to thinking about Fit for Life again. If anyone has that original paperback, could you look up a recipe for me? I remember a delicious vegetable broth based soup with fennel or leeks. I would love to revisit that recipe and see if it was as good as I remember. I think I will go juice some oranges now. I’m linking up with Deb at Kahakai Kitchen and Souper Sundays. 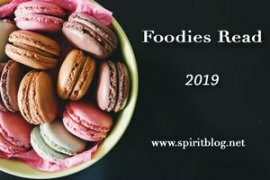 This post will also mark my first link up for 2019 with Foodies Read. This sounds like a book that I would enjoy too. The salad looks wonderful! I really like the idea of turmeric and blueberries together. This sounds delicious! I always enjoy Dr. Roizen if I catch him on Dr. Oz. And your salad would be perfect for my lunches—not sure the hubby would probably grill me about each ingredient and then take a pass, but I’m happy to keep it all to myself! Healthy eating is really something I need to change up in my diet. I have a hard time making myself food much less making it healthy though. I think I’m grown enough to start seriously meal planning healthy foods though. Sometimes books, like the decluttering one I just read, are gentle reminders and good books to get back to when you need to make a change. Thanks for the honest book review. Sounds like a great reinforcement and reminder of what we should be doing. Sugar is my biggest problem, but I’m working on it. This salad is chocked full of goodness. I just happened to have bought some red quinoa recently, so now I can put it to good use. Thanks! Good! Hope you try it, MJ. I think sometimes the biggest benefit to these books is the gentle reminders of what we should be doing. 😉 This sounds like worth a library check out. 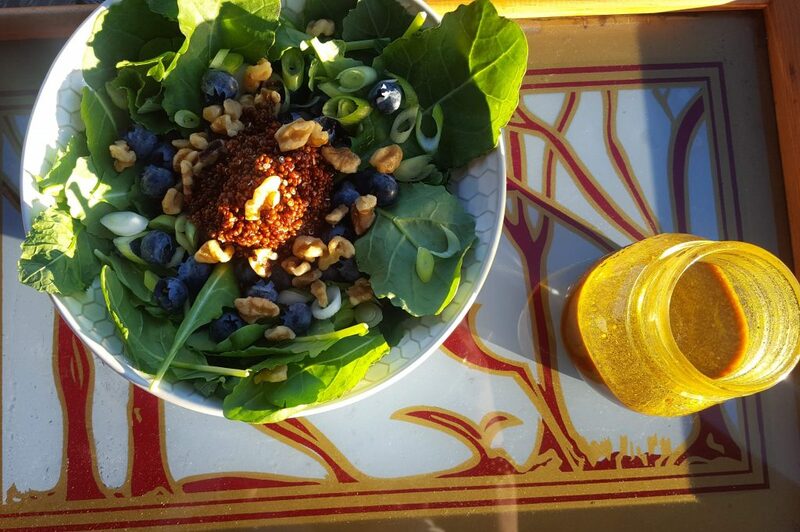 Thanks for sharing your salad (which looks delicious) with Souper Sundays this week. True. And I definitely need reminders.